Rooflight blinds can be designed and manufactured by SHY to fit virtually any size, shape, angle or age of window. Utilising a wide choice of blind fabrics, every level of shading, through to full dim-out can be achieved. SHY rooflight blinds are used in many commercial installations as well as high-end domestic situations. They are ideal when rooflights or skylights are used to provide much needed light but want to be able to control the amount of light and heat that could cause problems for the building and its occupants. When combined with SHY's ZIP channel, the fabric is guided so it always retracts exactly square, every time so can be used on long thin rooflights whilst their fabric tension system (FTS) ensures that wide and/or long blinds operate without sagging or rippling. If you would like advice on the type of shading solution best for your rooflight or skylight, please do contact us as the in-house designers and manufacturing experts at SHY are on-hand to help and advise you. SHY® ZIP® blinds are flexible, easy to operate and extremely durable. Developed and proven through years of successful installations – often in very challenging situations – they achieve a standard virtually unsurpassed by any other roller blind screen system on the UK market today. The heart of the system is SHY®’s specially designed zipper ribbon which is welded to the edges of the blind fabric to create a super-strong, flat, join. The zipper ribbon is securely held in a shaped plastic side channel housed in an aluminium sied channel. This allows the blind to run freely and quietly but prevents the fabric from being pulled out of the channel. With all SHY® ZIP® blinds, the hem bar of the blind is also permanently fixed to the fabric and a brush strip prevents light ingress when the blind runs into the optional bottom channel. SHY® ZIP® blinds’ side guides trap cloth in the side channels achieving an excellent light seal. The optional bottom channel receives the hem bar with brush strip, which reduces light ingress around the base of the blind. The cassette headbox, with fitting possibilities though the box itself, also minimises light gaps around the head of the blind. 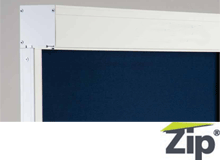 With SHY® ZIP®’s fully cassetted system air is trapped between the glazing and the blind fabric providing additional insulation. In fact the Chartered Institute of Building Services Engineers (CIBSE) guidance on the thermal resistance of blinds states that a fully cassetted blind with a low emissivity fabric is 8.8 times more effective that a standard roller blind. With the blind fully lowered, the air trapped between the glazing and blind fabric helps to reduce noise in a similar way to double glazing. The robust SHY® ZIP® guides prevent the cloth from pulling or blowing out of the side channels, even when fitted externally. Dimout, shading, light control, heat control, insect screens, room dividers, business presentation & home cinema screens. With a compact headbox which contains the cloth cassette and operating mechanism plus slim, aluminium side and bottom channels, SHY® ZIP® blinds can provide an attractive complement to the surrounding decor. The aluminium hardware can be anodised or powder coated to any RAL/BS colour. Maintenance access (for all but the smallest, 65mm square head box) is via an easily removed front cover on the headbox. This can be removed for maintenance while the blind is in position.